My main research interests are programming languages and concurrency, both theory and systems. I am particularly intrigued by the problem of making software development more productive and robust. With the explosive rise of connected systems, like the Internet of Things, Edge Computing, Cloud Computing, and other distribute systems, today like never before we need solid programming methods that can support programmers in keeping up with the complexity of systems. Improving our programming theories and tools holds the key to better productivity, innovation, and software that we can rely on. Here's a summary of some of the research directions that I work on, including references . Microservices is a programming paradigm where all components are autonomous, reusable services that interact by exchanging messages. It has emerged as the de-facto modern paradigm for many system integrations, the Internet of Things, Edge Computing, and Cloud Computing. While the methods of microservices had already been around for years, the term became widespread after the blog post by Lewis and Fowler . Later, we wrote the first academic survey on the current status and future of the paradigm [Dragoni et al., 2017]. I am the co-creator and maintainer of Jolie, the first microservice-oriented programming language [Montesi et al., 2014]. The first version of Jolie was created in 2006, and was published in 2007 [Montesi et al., 2007]. What sets Jolie apart from other languages is that it makes us more efficient and less prone to errors, by offering native primitives for the programming and deployment of microservices. Fault recovery is an important part of this. Concretely, Jolie draws these primitives from the theory of process calculi, and brings them to practice by executing them with different protocols and data formats [Montesi, 2016]. Jolie has an active research and innovation community, commercial applications, and is taught in University courses. The Jolie community kickstarted the first international conference on Microservices. Not all programming models are born equal. The Curry-Howard correspondence showed us that some aspects of functional programming are absolute, as they share deep structures with logical reasoning. Now that we entered the era of concurrent and distributed systems, can we hope to find foundations that are as solid for concurrent programming? Abramsky  and Bellin and Scott  kickstarted this search, driven by the alluring idea that a similar correspondence might exist between linear logic [Girard, 1987] and the pi-calculus [Milner et al., 1992]. This initial development was followed by a good series of successes. Caires and Pfenning  saw that linear propositions can be seen as the session types by Honda , i.e., types for communication protocols. 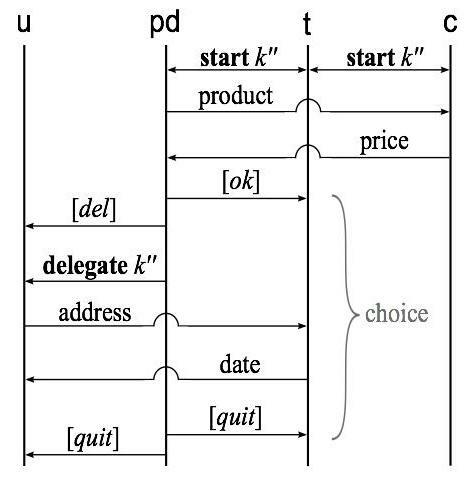 Wadler  formalised the first connection between a standard presentation of session types for a functional language and linear logic. However, there remained fundamental discrepancies between linear logic and the pi-calculus (and in general, most process calculi): there was no logical rule corresponding to parallel composition, the hallmark of concurrency. This discrepancy leaks to semantics, which does not quite correspond to that of the pi-calculus, and ultimately generates a chasm: the tools developed for decades by researchers for studying the observable behaviour of processes could not be used in this research line. In [Kokke et al., 2019], we overcame this issue by showing that there exists a conservative reformulation of linear logic based on hypersequents, originally developed by Avron . The key idea is to use hypersequents to capture that two collections of propositions can be proven independently. This led us to the rule in the figure. Say that you have two independent processes P and Q typed by G and H respectively; then, the parallel composition P|Q (with P and Q independent) is typed by G|H. In other words, the protocols in G are run in parallel to those in H. In the paper, we show that this leads to a logical reconstruction of a behavioural theory for the pi-calculus corresponding to linear logic. We made several other contributions to this research line, for example the discovery that Multiparty Session Types (protocols with multiple participants) correspond to a sound generalisation of the principle of duality of linear logic. I developed the first proof-of-concept of choreographic programming in my PhD thesis [Montesi, 2013], where choreographies can be composed and then compiled to prototype implementations of microservices. Wen Kokke, Fabrizio Montesi, & Marco Peressotti. (2019). Taking Linear Logic Apart. In V. de P. Thomas Ehrhard Maribel Fernández & L. T. de Falco (Eds. ), Proceedings Joint International Workshop on Linearity & Trends in Linear Logic and Applications (Linearity-TLLA 2018), Oxford, UK, 7-8 July 2018. Wen Kokke, Fabrizio Montesi, & Marco Peressotti. (2019). Better Late Than Never: A Fully-abstract Semantics for Classical Processes. Proc. ACM Program. Lang., 3(POPL), 24:1–24:29. Luís Cruz-Filipe, Fabrizio Montesi, & Marco Peressotti. (2018). Communications in choreographies, revisited. In H. M. Haddad, R. L. Wainwright, & R. Chbeir (Eds. ), Proceedings of the 33rd Annual ACM Symposium on Applied Computing, SAC 2018, Pau, France, April 09-13, 2018 (pp. 1248–1255). ACM. Fabrizio Montesi, & Janine Weber. (2018). From the decorator pattern to circuit breakers in microservices. In H. M. Haddad, R. L. Wainwright, & R. Chbeir (Eds. ), Proceedings of the 33rd Annual ACM Symposium on Applied Computing, SAC 2018, Pau, France, April 09-13, 2018 (pp. 1733–1735). ACM. Marco Carbone, Fabrizio Montesi, & Carsten Schürmann. (2018). Choreographies, logically. Distributed Computing, 31(1), 51–67. Saverio Giallorenzo, Fabrizio Montesi, & Maurizio Gabbrielli. (2018). Applied Choreographies. In Formal Techniques for Distributed Objects, Components, and Systems - 38th IFIP WG 6.1 International Conference, FORTE 2018, Held as Part of the 13th International Federated Conference on Distributed Computing Techniques, DisCoTec 2018, Madrid, Spain, June 18-21, 2018, Proceedings (pp. 21–40). Springer. Luís Cruz-Filipe, Kim S. Larsen, & Fabrizio Montesi. (2017). The Paths to Choreography Extraction. In J. Esparza & A. S. Murawski (Eds. ), FoSSaCS (Vol. 10203, pp. 424–440). Springer. Luís Cruz-Filipe, & Fabrizio Montesi. (2017). A Core Model for Choreographic Programming. In O. Kouchnarenko & R. Khosravi (Eds. ), FACS (Vol. 10231, pp. 17–35). Springer. Luís Cruz-Filipe, & Fabrizio Montesi. (2017). Encoding Asynchrony in Choreographies. In D. Shin & M. Lencastre (Eds. ), Proceedings of the Symposium on Applied Computing, SAC 2017, Marrakech, Morocco, April 3-7, 2017 (pp. 1175–1177). Luís Cruz-Filipe, & Fabrizio Montesi. (2017). Procedural Choreographic Programming. In A. Bouajjani & A. Silva (Eds. ), Formal Techniques for Distributed Objects, Components, and Systems – 37th IFIP WG 6.1 International Conference, FORTE 2017 (Vol. 10321, pp. 92–107). Springer. Cruz-Filipe Luı́s, & Fabrizio Montesi. (2017). That’s Enough: Asynchrony with Standard Choreography Primitives. In C. Caleiro, Dionı́sio Francisco, P. Gouveia, P. Mateus, & J. Rasga (Eds. ), Logic and Computation: Essays in Honour of Amı́lcar Sernadas (Vol. 33, pp. 125–142). College Publications. Luís Cruz-Filipe, & Fabrizio Montesi. (2017). On Asynchrony and Choreographies. In M. Bartoletti, L. Bocchi, L. Henrio, & S. Knight (Eds. ), Proceedings 10th Interaction and Concurrency Experience (Vol. 261, pp. 76–90). Open Publishing Association. Marco Carbone, Fabrizio Montesi, Carsten Schürmann, & Nobuko Yoshida. (2017). Multiparty session types as coherence proofs. Acta Inf., 54(3), 243–269. Nicola Dragoni, Saverio Giallorenzo, Alberto Lluch Lafuente, Manuel Mazzara, Fabrizio Montesi, Ruslan Mustafin, & Larisa Safina. (2017). Microservices: yesterday, today, and tomorrow. In Present and Ulterior Software Engineering (pp. 195–216). Springer. Claudio Guidi, Ivan Lanese, Manuel Mazzara, & Fabrizio Montesi. (2017). Microservices: A Language-Based Approach. In Present and Ulterior Software Engineering (pp. 217–225). Springer. Fabrizio Montesi. (2017). Classical Higher-Order Processes - (Short Paper). In FORTE (Vol. 10321, pp. 171–178). Springer. Fabrizio Montesi, & Dan Sebastian Thrane. (2017). Packaging Microservices - (Work in Progress). In DAIS (Vol. 10320, pp. 131–137). Springer. Luís Cruz-Filipe, & Fabrizio Montesi. (2016). Choreographies in Practice. In E. Albert & I. Lanese (Eds. ), Formal Techniques for Distributed Objects, Components, and Systems – 36th IFIP WG 6.1 International Conference, FORTE 2016 (Vol. 9688, pp. 114–123). Springer. Larisa Safina, Manuel Mazzara, Fabrizio Montesi, & Rivera Vı́ctor. (2016). Data-Driven Workflows for Microservices: Genericity in Jolie. In AINA (pp. 430–437). IEEE Computer Society. Marco Carbone, Sam Lindley, Fabrizio Montesi, Carsten Schürmann, & Philip Wadler. (2016). Coherence Generalises Duality: A Logical Explanation of Multiparty Session Types. In CONCUR (Vol. 59, pp. 33:1–33:15). Schloss Dagstuhl - Leibniz-Zentrum fuer Informatik. Davide Ancona, Viviana Bono, Mario Bravetti, Joana Campos, Giuseppe Castagna, Pierre-Malo Deniélou, … Nobuko Yoshida. (2016). Behavioral Types in Programming Languages. Foundations and Trends in Programming Languages, 3(2-3), 95–230. Fabrizio Montesi. (2016). Process-aware web programming with Jolie. Sci. Comput. Program., 130, 69–96. Maurizio Gabbrielli, Saverio Giallorenzo, Claudio Guidi, Jacopo Mauro, & Fabrizio Montesi. (2016). Self-Reconfiguring Microservices. In Theory and Practice of Formal Methods - Essays Dedicated to Frank de Boer on the Occasion of His 60th Birthday (pp. 194–210). Springer. Marco Carbone, Fabrizio Montesi, Carsten Schürmann, & Nobuko Yoshida. (2015). Multiparty Session Types as Coherence Proofs. In L. Aceto & D. de Frutos-Escrig (Eds. ), 26th International Conference on Concurrency Theory, CONCUR 2015, Madrid, Spain, September 1.4, 2015 (Vol. 42, pp. 412–426). Schloss Dagstuhl - Leibniz-Zentrum fuer Informatik. Fabrizio Montesi. (2015). Kickstarting Choreographic Programming. In T. T. Hildebrandt, A. Ravara, J. M. van der Werf, & M. Weidlich (Eds. ), Web Services, Formal Methods, and Behavioral Types - 11th International Workshop, WS-FM 2014, Eindhoven, The Netherlands, September 11-12, 2014, and 12th International Workshop, WS-FM/BEAT 2015, Madrid, Spain, September 4-5, 2015, Revised Selected Papers (Vol. 9421, pp. 3–10). Springer. Mario Bravetti, Alberto Lluch-Lafuente, Manuel Mazzara, & Fabrizio Montesi. (2015). Guest Editorial: Special Issue on Service-Oriented Architectures and Programming. J. Internet Serv. Inf. Secur., 5(1), 1–2. Ivan Lanese, Manuel Mazzara, & Fabrizio Montesi. (2015). Special issue on Service-Oriented Architecture and Programming (SOAP 2013). Sci. Comput. Program., 97, 181–182. Ivan Lanese, Fabrizio Montesi, & Gianluigi Zavattaro. (2015). The Evolution of Jolie - From Orchestrations to Adaptable Choreographies. In R. D. Nicola & R. Hennicker (Eds. ), Software, Services, and Systems - Essays Dedicated to Martin Wirsing on the Occasion of His Retirement from the Chair of Programming and Software Engineering (Vol. 8950, pp. 506–521). Springer. Fabrizio Montesi, Claudio Guidi, & Gianluigi Zavattaro. (2014). Service-Oriented Programming with Jolie. In A. Bouguettaya, Q. Z. Sheng, & F. Daniel (Eds. ), Web Services Foundations (pp. 81–107). Springer. Marco Carbone, Fabrizio Montesi, & Carsten Schürmann. (2014). Choreographies, Logically. In P. Baldan & D. Gorla (Eds. ), CONCUR 2014 - Concurrency Theory - 25th International Conference, CONCUR 2014, Rome, Italy, September 2-5, 2014. Proceedings (Vol. 8704, pp. 47–62). Springer. Marco Carbone, Ornela Dardha, & Fabrizio Montesi. (2014). Progress as Compositional Lock-Freedom. In eva Kühn & R. Pugliese (Eds. ), Coordination Models and Languages - 16th IFIP WG 6.1 International Conference, COORDINATION 2014, Held as Part of the 9th International Federated Conferences on Distributed Computing Techniques, DisCoTec 2014, Berlin, Germany, June 3-5, 2014, Proceedings (Vol. 8459, pp. 49–64). Springer. Maurizio Gabbrielli, Saverio Giallorenzo, & Fabrizio Montesi. (2014). Service-Oriented Architectures: From Design to Production Exploiting Workflow Patterns. In S. Omatu, H. Bersini, Rodrı́guez Juan M. Corchado, Rodrı́guez Sara, P. Pawlewski, & E. Bucciarelli (Eds. ), Distributed Computing and Artificial Intelligence, 11th International Conference, DCAI 2014, Salamanca, Spain, June 4-6, 2014 (Vol. 290, pp. 131–139). Springer. Fabrizio Montesi, & Nobuko Yoshida. (2013). Compositional Choreographies. In P. R. D’Argenio & H. C. Melgratti (Eds. ), CONCUR 2013 - Concurrency Theory - 24th International Conference, CONCUR 2013, Buenos Aires, Argentina, August 27-30, 2013. Proceedings (Vol. 8052, pp. 425–439). Springer. Marco Carbone, & Fabrizio Montesi. (2013). Deadlock-freedom-by-design: multiparty asynchronous global programming. In R. Giacobazzi & R. Cousot (Eds. ), The 40th Annual ACM SIGPLAN-SIGACT Symposium on Principles of Programming Languages, POPL ’13, Rome, Italy - January 23 - 25, 2013 (pp. 263–274). ACM. Fabrizio Montesi. (2013). Process-aware web programming with Jolie. In S. Y. Shin & J. C. Maldonado (Eds. ), Proceedings of the 28th Annual ACM Symposium on Applied Computing, SAC ’13, Coimbra, Portugal, March 18-22, 2013 (pp. 761–763). ACM. Ivan Lanese, Fabrizio Montesi, & Gianluigi Zavattaro. (2013). Amending Choreographies. In A. Ravara & J. Silva (Eds. ), Proceedings 9th International Workshop on Automated Specification and Verification of Web Systems, WWV 2013, Florence, Italy, 6th June 2013. (Vol. 123, pp. 34–48). Fabrizio Montesi. (2013). Choreographic Programming (Ph.D. Thesis). IT University of Copenhagen. Mila Dalla Preda, Maurizio Gabbrielli, Claudio Guidi, Jacopo Mauro, & Fabrizio Montesi. (2012). Interface-Based Service Composition with Aggregation. In F. D. Paoli, E. Pimentel, & G. Zavattaro (Eds. ), Service-Oriented and Cloud Computing - First European Conference, ESOCC 2012, Bertinoro, Italy, September 19-21, 2012. Proceedings (Vol. 7592, pp. 48–63). Springer. Mila Dalla Preda, Maurizio Gabbrielli, Claudio Guidi, Jacopo Mauro, & Fabrizio Montesi. (2012). Service integration via target-transparent mediation. In 2012 Fifth IEEE International Conference on Service-Oriented Computing and Applications (SOCA), Taipei, Taiwan, December 17-19, 2012 (pp. 1–5). IEEE Computer Society. Marco Carbone, & Fabrizio Montesi. (2012). Merging Multiparty Protocols in Multiparty Choreographies. In S. J. Gay & P. Kelly (Eds. ), Proceedings Fifth Workshop on Programming Language Approaches to Concurrency- and Communication-cEntric Software, PLACES 2012, Tallinn, Estonia, 31 March 2012. (Vol. 109, pp. 21–27). Jacopo Mauro, Maurizio Gabbrielli, Claudio Guidi, & Fabrizio Montesi. (2011). An Efficient Management of Correlation Sets with Broadcast. In W. D. Meuter & G.-C. Roman (Eds. ), Coordination Models and Languages - 13th International Conference, COORDINATION 2011, Reykjavik, Iceland, June 6-9, 2011. Proceedings (Vol. 6721, pp. 80–94). Springer. Fabrizio Montesi, & Marco Carbone. (2011). Programming Services with Correlation Sets. In G. Kappel, Z. Maamar, & H. R. M. Nezhad (Eds. ), Service-Oriented Computing - 9th International Conference, ICSOC 2011, Paphos, Cyprus, December 5-8, 2011 Proceedings (Vol. 7084, pp. 125–141). Springer. Ivan Lanese, & Fabrizio Montesi. (2010). Error Handling: From Theory to Practice. In T. Margaria & B. Steffen (Eds. ), Leveraging Applications of Formal Methods, Verification, and Validation - 4th International Symposium on Leveraging Applications, ISoLA 2010, Heraklion, Crete, Greece, October 18-21, 2010, Proceedings, Part II (Vol. 6416, pp. 66–81). Springer. Ivan Lanese, Antonio Bucchiarone, & Fabrizio Montesi. (2010). A Framework for Rule-Based Dynamic Adaptation. In M. Wirsing, M. Hofmann, & A. Rauschmayer (Eds. ), Trustworthly Global Computing - 5th International Symposium, TGC 2010, Munich, Germany, February 24-26, 2010, Revised Selected Papers (Vol. 6084, pp. 284–300). Springer. Fabrizio Montesi, & Davide Sangiorgi. (2010). A Model of Evolvable Components. In M. Wirsing, M. Hofmann, & A. Rauschmayer (Eds. ), Trustworthly Global Computing - 5th International Symposium, TGC 2010, Munich, Germany, February 24-26, 2010, Revised Selected Papers (Vol. 6084, pp. 153–171). Springer. Fabrizio Montesi, Claudio Guidi, Ivan Lanese, & Gianluigi Zavattaro. (2008). Dynamic Fault Handling Mechanisms for Service-Oriented Applications. In C. Pahl, S. Clarke, & R. Eshuis (Eds. ), ECOWS 2008, Sixth European Conference on Web Services, 12-14 November 2008, Dublin, Ireland (pp. 225–234). IEEE Computer Society. Claudio Guidi, Ivan Lanese, Fabrizio Montesi, & Gianluigi Zavattaro. (2009). Dynamic Error Handling in Service Oriented Applications. Fundam. Inform., 95(1), 73–102. Claudio Guidi, Ivan Lanese, Fabrizio Montesi, & Gianluigi Zavattaro. (2008). On the interplay between fault handling and request-response service invocations. In ACSD (pp. 190–198). IEEE. Ivan Lanese, Claudio Guidi, Fabrizio Montesi, & Gianluigi Zavattaro. (2008). Bridging the Gap between Interaction- and Process-Oriented Choreographies. In SEFM (pp. 323–332). IEEE Computer Society. Fabrizio Montesi, Claudio Guidi, & Gianluigi Zavattaro. (2007). Composing Services with JOLIE. In ECOWS (pp. 13–22). IEEE Computer Society. Fabrizio Montesi, Claudio Guidi, Roberto Lucchi, & Gianluigi Zavattaro. (2007). JOLIE: a Java Orchestration Language Interpreter Engine. Electr. Notes Theor. Comput. Sci., 181, 19–33. Farhad Arbab, Luís Cruz-Filipe, Sung-Shik Jongmans, & Fabrizio Montesi. Connectors Meet Choreographies. Marco Carbone, Luís Cruz-Filipe, Fabrizio Montesi, & Agata Murawska. Multiparty Classical Choreographies. Luís Cruz-Filipe, & Fabrizio Montesi. A Core Model for Choreographic Programming. Luís Cruz-Filipe, & Fabrizio Montesi. Procedural Choreographic Programming. Luís Cruz-Filipe, & Fabrizio Montesi. On Asynchrony and Choreographies. Maurizio Gabbrielli, Saverio Giallorenzo, & Fabrizio Montesi. (2015). Applied Choreographies. CoRR, abs/1510.03637. Fabrizio Montesi, & Marco Peressotti. (2017). Choreographies meet Communication Failures. CoRR, abs/1712.05465. Fabrizio Montesi, & Marco Peressotti. (2018). Classical Transitions. CoRR, abs/1803.01049.